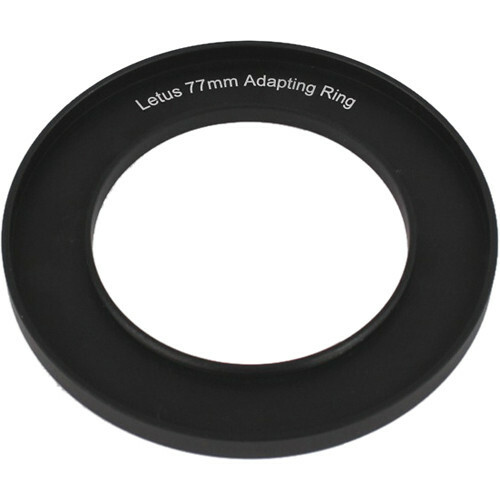 This LT-ANX-77 AnamorphX 77mm Adapting Ring from Letus35 allows you to use your Letus AnamorphX Adapter with cine lenses that feature a 77mm front lens diameter. The ring is made from CNC machined aluminum that is anodized black for wear and corrosion resistance. The inside circumference of this adapter is threaded to accept available step down rings allowing you to use it with lenses that feature a front lens barrel diameter smaller than 77mm. Box Dimensions (LxWxH) 5.512 x 4.567 x 0.709"
LT-ANX-77 AnamorphX 77mm Adapting Ring is rated 5.0 out of 5 by 1. Rated 5 out of 5 by Mark from So far so good I’m new to Anamorphic lenses and not that knowledgeable regarding them. I use them primarily for still photography. I have several anamorphics and just got this one. In comparison to the others this appears sharper with very little vignetting with the 85mm prime I have paired it with. It has produced some nice flares and a nice overall look. I am happy with it and look forward to seeing what it will do.